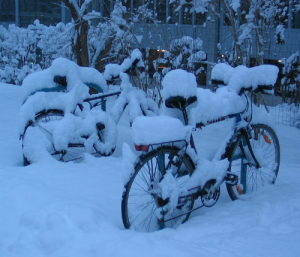 Riding a bicycle in the snow can be hazardous if you are not properly prepared or fail to exercise caution. Many people in Boston and Cambridge, though, continue to ride regardless of the weather for either exercise, to run an errand or for commuting. Injuries from bike accidents in the snow can be compensable if a motorist’s negligent driving or a property owner’s failure to clear the sidewalk or access area contributed to your injury. Your conduct, however, along with what you were wearing and the features on your bicycle will be carefully scrutinized in determining if you were comparatively negligent in causing your own injuries or whether you can collect compensation at all. Wear a water proof outer jacket and dress in layers since you can easily overheat. Wear a cap or warm covering for your ears that fits under your bike helmet. Do not use bicycle shoes that clip in but use a cage for riding shoes. You want to be able to quickly get a foot down if you lose control on ice or snow. Get a blinking light on your helmet or on the front and back of your bike so you are readily seen by anyone in the day or night. Avoid riding when it is snowing or shortly thereafter because of buildup on roadways. Avoid metal surfaces like manhole covers as they become slippery. Consider a hub brake or aluminum rims. Take extra time to brake and do not speed. Rinse and dry off your bike after completing your ride. Keep it lubricated and free of debris and mud. Always assume that a motorist does not see you. Do not ride on sidewalks unless posted signs allow it and it is safe to do so. If you are in an accident, take photographs of the site if you can, obtain the names of any witnesses and do not have your bike repaired before calling Burns & Jain to discuss a possible claim. As a bicyclist on the roadways, you are considered a motor vehicle and must adhere to all traffic laws including stopping at all red lights and stop signs. 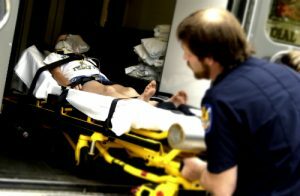 If you roll through a light or sign and collide with a car or pedestrian, you will likely be held at least comparatively negligent for your injuries. Motorists do have a duty to exercise ordinary care under any driving conditions. This includes slowing down in the snow and being aware of bicyclists on the roadways, especially where there are designated bike lanes. For your own safety, if you are turning or at any intersection, try to get the attention of a motorist before proceeding. Motorists often fail to completely stop at sign signs or ignore red traffic signals. Impaired or distracted driving, or driving too fast for conditions are common factors in cars or trucks colliding with bicycles. Neil Burns and Roshan Jain are bike accident lawyers in Boston who can subpoena a motorist’s cell phone records if texting or calling on a cell phone was a probable factor in causing your accident. Property owners in Massachusetts also have a duty and are required by law to clear snow off sidewalks, ramps and walkways under their control. If snow accumulated on a sidewalk where you are permitted to ride, you may have cause of action against the property owner. Be cautioned, however, that you may be deemed at least comparatively at fault if you were aware of the hazardous condition of the sidewalk or ramp and rode on it anyway. If you do take proper precautions and have done all you could to protect yourself and to ride as safely as possible under the conditions, then any negligence by a motorist or property owner could entitle you to compensation for your injuries. If the driver was uninsured, you could bring a claim under the uninsured provision of your own auto liability policy, or the policy of someone in your home. Bike accidents in the snow can result in catastrophic injuries such as traumatic brain injury, broken limbs, crushing injuries, internal organ damage and bleeding and loss of cognitive and physical abilities that can be permanent. Liability as well as the nature and extent of your injuries are often contested by skeptical insurance adjusters. Contact bike accident law firm Burns & Jain who has represented the interests of injured victims for more than 25 years to ensure all your legal options are discussed and that your injury claim is handled and presented by a legal professional.